With less than a week before lower principal limit factors go into effect, reverse mortgage counseling sessions are difficult to come by. But a select few answered the Department of Housing and Urban Development’s call for agencies with availability, and could potentially provide a last-minute option for Home Equity Conversion Mortgage applicants. The list, obtained by Reverse Mortgage Daily and sent out to all approved HECM counselors, shows 36 agencies across the country with reported availability through the end of this week. Most have nationwide reach, though some are location-specific — for example, the list has an agency that only does face-to-face sessions in Washington, D.C., and another that can serve potential borrowers in every state except Massachusetts and Wisconsin. Some firms on the list, which was current as of Tuesday morning, have the capacity to take on up to 80 clients, while some had as few as one slot left. Others simply indicated “yes” to availability, without a specific number of open sessions. The list comes in response to a request from HUD last week. Officials put out an all-points bulletin for counseling agencies able to squeeze in more applicants before new rules regarding tighter principal limit factors and mortgage insurance premiums go into effect October 2. Multiple counseling agencies told RMD that slots were either full or nearly gone as early as mid-September, with one seeing its daily client volume more than double from the normal average. And though it provided the list of available agencies, HUD warned that they might not stay open for long — and borrowers could still end up in the lurch. HUD also warned counselors not to skirt the rules just because there’s a deadline looming. “All agencies are still required to adhere to HECM counseling requirements prescribed by HUD and state law where the client resides,” the message warns. And all those who may have hoped for a last-minute reprieve from the rapidly approaching deadline aren’t likely to find salvation from HUD: In a separate message, HUD officials made it clear that the October 2 deadline is firm, whether or not everyone who wants a HECM under the old rules eventually gets a coveted counseling slot. 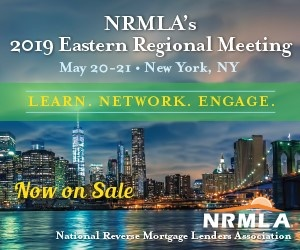 *UPDATE, 9/27, 2 p.m. CDT: Despite HUD’s potentially confusing wording, National Reverse Mortgage Lenders Association director of public relations Jenny Werwa points out that prospective borrowers cannot receive case numbers until they finish the counseling process.